We are a uniquely multi-disciplinary school working at the cutting edge of design in its broadest sense, and unified through a drive for environmental, economic, and cultural sustainability. Our Technology and Design research groups work with the private and public sectors driving innovation in the areas of health, security and industrial practice. Our work in the areas of Archive and Design History and Practice as Research are concerned with themes of preservation, commemoration and revitalisation, enriching lives worldwide. ULITA - An Archive of International Textile and the Yorkshire Fashion Archive, both based at the University of Leeds, continue to offer invaluable resource and expert services to a range of stakeholders including private companies, academics and the media. ULITA provides a collection of textile archives from across the world and periods of history which are used for teaching and research as well as for public events such as annual temporary exhibitions. The Yorkshire Fashion Archive is a collection of garments from across the 20th Century, specific to the Yorkshire region. The collection is used to influence research into fashion history and local culture. The Clothworker's Company, founded by the Royal Charter in 1528, is a philanphropic organisation with a textile heriage and was one of the founders of the University of Leeds. 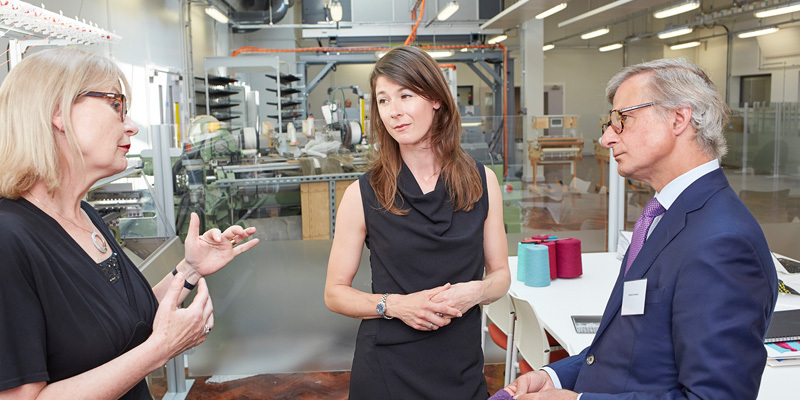 We work very closely with the Clothworker's Company and have established an innovation fund to support projects in the textile and colour science areas that have commercial potential. More than 40 projects have been supported and two have already generated a return. The fund supports patent protection, proof of concept, initial marketing and prototyping and a key element of the scheme is provision of business consultancy support to the academic team. It facilitates multi-disciplinary collaboration between academics and actively supports the involvement of undergraduate and postgraduate students in the projects. A proportion of any commercial returns generated by projects comes back to the fund to replenish its resources. Keracol – designing products that link sustainability with performance in the area of cosmetics and personal care products utilising the array of chemistry that nature provides. In 2018 we opened our ERDF funded multi million pound 3D Weaving Innovation Centre which works with local SME’s in the region to enhance their weaving experience, identifying new commercial opportunities for 3D woven structures in traditional and high value manufacturing sectors and producing innovative 3D woven prototype materials. In October 2018, Dr Mark Sumner presented evidence at the first hearing as part of UK Parliament's inquiry into the sustainability of the fashion industry.